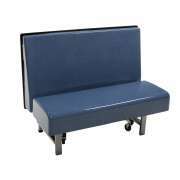 Purchase Booth & Cluster Seating For Your Cafeteria: Shop Now! If you are looking for a great way to spice up your eating space, booth seating is an excellent choice. Can you get booth seating for a cafeteria? Whether you prefer fixed or mobile units, benches or individual seats, Hertz Furniture has what you need to enjoy this attractive option. A selection of styles and colors can fit many different price ranges and configurations. 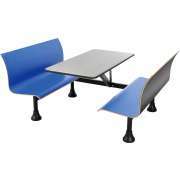 Unlike classic cafeteria tables, cluster seating lets students or professionals enjoy a meal with their friends without having to compromise on personal space. Individual seats attached to tables ensure that every person can sit comfortably and the right number of chairs is always available. When it comes to choosing chairs and tables for a lunchroom or common area cluster tables have everything you need in one attractive package. Dining booths are tables which include built-in booths. This is a great arrangement because the booths will always fit the height and style of the tables, so you don’t have to go looking around for a match. You can choose complementary colors that will brighten up your space and you won’t need to worry about seats disappearing or being taken out of the room for use in other places. What kinds of diner booths are there? In terms of configuration, the two main kinds of diner booths are wall booths and island booths. Most spaces will work best with a combination of these options when the main goal in finding the best layout is to maximize seating capacity. If you want a combination of booths and regular tables, you might want to consider getting some wall booths and putting the standard tables in the middle. You don’t have to compromise on flexibility to enjoy restaurant booth seating in your eating space. Mobile booths have the same aesthetic appeal as the permanent options with the added benefit of versatility. 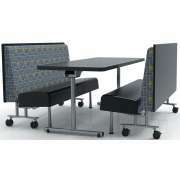 They stand firmly in place while in use but can be folded up and nested compactly when the space needs to be cleared. 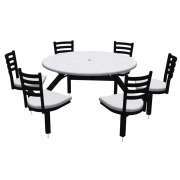 This is the best option for eating spaces which often need to be rearranged or repurposed for special events. Built-in casters on our mobile booths makes it easy to roll them in and out of storage, configure and reconfigure your space as often as you need. Aside from the choice of style, there are also a few options when it comes to materials. 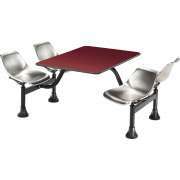 Standard cafe booths have laminate tops and seats which are available in a huge selection of colors. Laminate is scratch and stain resistant and has a smooth surface that is relatively easy to maintain. For a more upscale option, fiberglass booths are the way to go. They are more attractive and durable, and offer enhanced comfort. 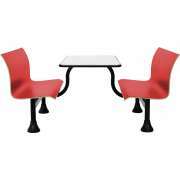 What is the difference between booth seating and cluster seating? 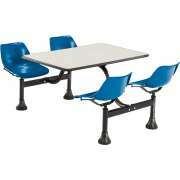 There are a few differences between diner booths and cluster tables, but the main one is in the seating style. 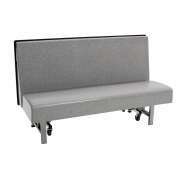 Rather than offering long attached benches, cluster seating features individual seats. This allows people to enjoy personal space while eating together and prevents the tables from becoming overcrowded. 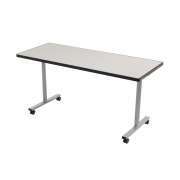 What kind of seats do cluster tables have? Cluster seating is attached directly to the table so it cannot be moved independently. Unlike standard chairs, the auto-return swivel seats save the hassle of pushing in chairs and ensure that there are always the right amount of spots around each table. This allows easy entry and exit from seats, while maintaining a neat and organized look in your space. Seats are available in standard steel or stainless steel for enhanced durability. Whether you are just looking for a few new tables or you want to outfit the whole lunchroom, cluster seating and dining booths are sure to be a hit. With a great selection of sizes and configurations, you can enjoy this classy alternative to standard cafeteria tables anywhere. When you choose from these stylish options, you make your space stand out and create an inviting venue where professionals or students can enjoy a relaxing meal or break.